Clean, competitive, racing and great sportsmanship characterized the 2012 National Championship race week. We'll get some race videos up soon, that will show there was a whole lot more racing that went on than was covered this year! Each of the three races this week had a different winner, with Tyler Palmer taking the one that mattered, making him the 2012 National Champion! The cars really looked great this year! Shows off the class well! This past weekend the 944 crew of racers took to the famed Infineon Raceway(Sears Point) one weekend before the NASCAR boys, and put on a show for the pro’s. Five cars showed up for what was shaping up to be a hot weekend at one of the most challenging tracks in the world and we prove to be mostly up for the challenge. Saturday qualifying was cut short to two laps due to a red flag crash so times were not good but determination was high for the 5 o'clock race start. Steve Lewis and Jim Foxx were one, two separated by 2/10ths, followed by Jerry Whitteridge, and Ron Dale(me). Ken Huey qualified but a prior commitment made him put Ken Myers from IO port racing in the car for the race. Ken is an accomplished veteran racer who’s business sells great racing products at great prices and he is a part time 944’er so look him up for any parts you need. The start was a barn burner with Jim taking a small lead over Steve, and Me and Jerry duking it out. I stuck my nose inside Jerry going into turn 4 and he gave me just enough racing room to make it a clean pass. Ken Meyers pressured us from behind and got past Jerry, who was struggling with grip all weekend and eventually came in early with a mechanical. I set sail for the leaders and kept them in sight when Jim, feeling the pressure of Steve behind him, made an ill advised pass attempt on a Boxster going into turn 11. He dove to the inside, locked up all 4 tires and slid. I saw my chance and pushed hard to get by Steve but Infineon is a track that rewards skill over bravado and he has it in spades. All I could do is keep him in sight and hope for a miracle. What I got instead was a whirlwind of driving fury in the form of Jim Foxx. I got a call on the radio saying he was coming back through the field like he was on fire, and if you have ever raced with Jim, you know you don’t want him behind you when his blood is up. I put my head down and hustled the car but that only led to mistakes. He caught me on the last lap at turn 7, got inside me but went a little wide. I was determined not to be bullied by the Big Dog this time so held the gas down flat and we went side by side through the famed esses where nobody goes two wide. Jim gave me plenty of room but pulled a small advantage out of 9 leading into 10 and the braking zone of 11. I went through 10 faster than ever before, sliding sideways like a sprint car all the way into the dirt and made up enough space to make turn 11 interesting. I was hoping for a mistake and Jim didn’t disappoint! Jim is 10/10ths at all times and under braking he stepped it up to 11/10ths, going wide of the apex leaving me room inside but I carried a little too much braking into the turn and got sideways exiting, ruining a chance for a side by side finish. Great racing!! Sunday was a quick schedule, starting with 8 am practice and ending with 11 am race time. During practice I started losing gears so brought it in. I lost all forward drive right in front of my paddock spot. After burning my arm on the exhaust, I found the shift linkage bolt had backed out again and got it fixed in time to make the last half of qualifying, getting one hot lap good enough for third following Jim and Steve. Jerry led Ken to the green in fourth and fifth respectively. The start was another wild one! Going full tilt into the uphill turn two(Is there a turn one? )on cold tires, Jim lost control and slid off fast into the tire barrier nose first. After a few corners with no red flag I knew he was ok but I also noticed there was no yellows or safety truck flags so that meant Jim is back on course and coming! Sure enough my wife said on the radio he was very fast and looked angry. Steve put in flawless laps and stretched a big lead over Jerry, Ken and I. He was in sight of me but just. Jim was setting the fastest laps of the weekend and soon caught all of us but Steve. He got close and made it a race but Steve is the master of Infineon (at least until Rick comes to defend his throne!) and scored a clean sweep of the weekend. Jim took another second and I rounded out the podium again. Jerry and Ken followed us closely to cap off another great weekend. Thanks go out to 2Ken racing which is Ken Huey and Ken Meyers. Ken Huey and his tireless work and gracious manner make 944 racing special and Ken Meyers and IO Port racing bring class and experience to our group, and he races us tight and clean. Also we love having Jim Foxx and his girlfriend Katie racing with us in Norcal. They are always a highlight of the weekend and host the best parties at the “Mothership”. It was nice meeting Katie’s parents who came from Florida for the race and are staying to watch the NASCAR race. Jim gave Katie’s dad Charlie a ride at speed around the track and he loved it! Hope to see you all soon back at the track for “Porsches at the Point” in October. If you have never raced this track, mark your calendar, you will not be disappointed! 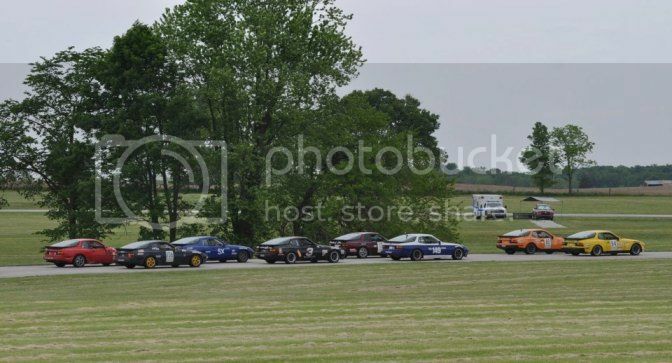 Round 2 of the NASA Midwest and Great Lakes 944 Spec season took place May 11-13 at Putnam Park. 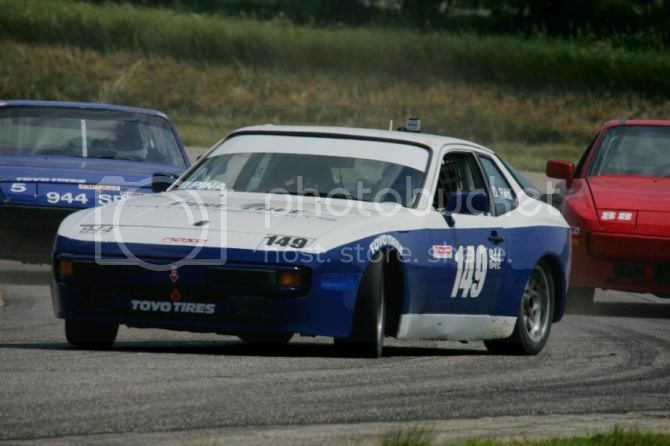 This is a favorite track for many drivers, with fast, sweeping turns that play to the Porsche 944’s inherent strengths. Phenomenal weather, a gorgeous venue, and more of the tight racing that makes this series so entertaining made it our finest weekend in recent memory. Race 1 promised and delivered tight battles, with Neal Agran, Eric Kuhns, and Dan Pina qualifying within hundredths of a second of each other. The spread between Angel Blazquez, Ken Frey, and Sid Chhikara in 4th-6th was three tenths, with Brad Raum only a second further back and Shannon McCue quickly coming up to speed after a five year hiatus from Putnam Park. Polesitter Agran and Kuhns had a perfect start, simultaneously dropping the hammer and drag racing side by side for 900 feet to turn 1. The pair ran wheel to wheel to turn 2, at which point Agran claimed the apex and assumed the lead. In the second row, Blazquez and Pina faced an immediate challenge from Frey, who surged from 5th to 3rd down the main straight as Blazquez fell back with a missed shift. Pina was able to retake 3rd in turn 2 when Frey ran wide at the track out, but Frey kept the throttle pinned, holding 4th and keeping on Pina’s bumper. A nose to tail battle for the lead ensued between Agran and Kuhns, with Pina taking advantage of the jockeying to reel in the leaders. Kuhns attacked in lap three with a run out of turn 4, but Agran defended, forcing Kuhns to the outside. The two braked side by side at 90mph for the high speed turn 5, with Agran emerging with a gap after Kuhns had to gather it up in the marbles. Pina pounced on this bobble to challenge for 2nd, eventually giving Agran the opportunity to stretch his lead to 7 seconds. Unfortunately for Agran, a defective axle assembly left him to coast to a stop from the lead in lap 12 and strike a fast friendship with the corner worker at turn 9. After much back and forth, Kuhns held off Pina to take the win, eventually stretching a several second lead. Frey earned his first podium finish, beating Blazquez to the line by 2 seconds after 30 minutes of dogged pursuit that generated extensive applause in the grandstand. Raum led Chhikara by 3 seconds for 5th, also fending off a lengthy pursuit, with McCue separated by only a single car. Sunday dawned with an unexpected surprise: our good friend Jon Wilson came by to film a video feature on the series for Car and Driver magazine. Several of our cars, nicely detailed by the Pinetree Motorsports crew, formed the backdrop for interviews. Jon’s new car build is nearing completion and we can’t wait to have him back racing with us! Despite copious traffic in the qualifier, several drivers were able to pick up time following TraqMate data coaching and video review on Sunday morning. The qualifying results reflected the progress, with Frey advancing to 4th on the grid, Chhikara to 5th (taking the position from Blazquez by 0.005 seconds! ), and McCue to 7th. Agran, Kuhns, and Pina again qualified in 1st-3rd, while Raum sat less than one second back from McCue in 8th. Agran and Kuhns reprised their drag race at the flag, with Agran again assuming the lead in turn 2. Pina surged from the second row to immediately challenge for 2nd, setting the stage for the best battle of the day. While Agran quietly slipped away to the victory, Pina and Kuhns swapped 2nd place multiple times with increasingly spectacular passes. Pina earned the position for keeps with a diving pass in GTS traffic on lap 9, eventually stretching a 7 second gap. Frey drove to 4th place and continued to advance his lap times nicely, while a dramatic fight between McCue and Chhikara raged for 5th. McCue seized the position from Chhikara in lap 2, after which the two were never separated by more than 3 seconds. Chhikara stuck his nose in to take a look multiple times, but McCue remained unruffled, staying consistent and bringing it home 2.7 seconds ahead of Chhikara. Raum was not far behind, while Blazquez retired early after recalling that he’d failed to reinstall his radiator cap back in the paddock. McCue’s and Pina’s performances deserve special mention. McCue took advantage of a chalk talk and insights gained from following video in warmup and qualifying to gain 2 seconds in the Sunday race, moving to competitive times with virtually no prior experience at Putnam. Pina’s 2nd place finish over Kuhns was his first triumph over the long-time series heavyweight in the dry, and marks another inevitable step towards a consistent challenge for the top of the podium. Two 944 Spec cars were among the 22 to take the green for the second round of the Midwest Endurance Challenge on Friday afternoon. Kuhns and Agran again teamed up in Kuhns’ #80 car in their quest for a third championship. The pair had the pace to dominate E3, winning the class by a large margin over a gaggle of Spec Miatas and finishing 3rd overall. Agran reset the two year old E3 lap record in his stint, only to see Kuhns claim it for his own by 1/100th of a second 30 minutes later. Expect more close racing this season!! Chhikara ran the 90 minute enduro as a “test and tune,” making pit stops every 20 minutes for TraqMate coaching by Eric Kuhns and occasional chassis adjustments. By the conclusion, his car was neatly dialed in. Kuhns later relayed some of these learnings to Pina, who benefited handsomely in the Sunday sprint race from a well considered sway bar adjustment. Besides having an outstanding time, Midwest 944 Spec drivers took home over $1300 in TOYO, HAWK, and BFG contingency dollars this weekend. A special thanks is due to Linda Kuhns for her culinary stylings and Jim and Kelby Hartman, who again offered technical support to all competitors during the event, prepared several of the best looking cars in the field, and maintained their record of perfect reliability. It also goes without saying that the mothers, wives, and girlfriends who allowed us to play with cars on Mother's day are in a class of their own. If you’ve read this far and you’re not racing with us… why not? We’d love to have you out to an event and give you a ride, let you take a test drive, and get you involved. 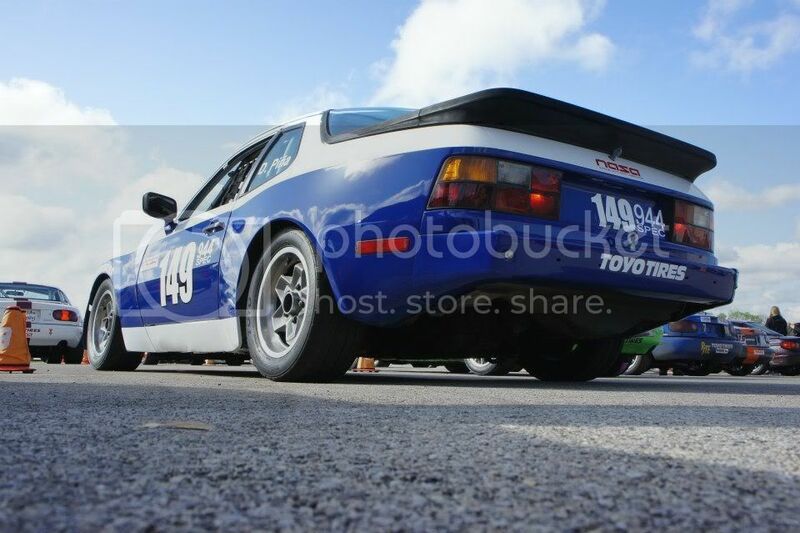 We believe 944 Spec is the best way to get racing fast and to get faster! Turnout was a little light for this event for the new Texas region 944Spec racers, but the strong growth continued to show with three new drivers completing Comp school and getting their racing licenses! Phil Hanson and Jason Stanley joined the fray for the whole weekend after Friday's comp school. Kilynn Weber completed the school but his sharp 924S needs a few safety items before it can compete. Phil Fromme took home three out of the four wins, showing both he and his car are in top form. The rest of the 944Spec world needs to be worried about Hallett next month as that is one of Phil's favorite tracks. Al Fernandez won the fourth race, while rookies Phil Hanson and Jason Stanley dramatically improved their lap times until they were within a mere second and a half off the pace over the relatively long TWS track. That is just excellent progress! The next Texas region event is at Hallett, which always draws entries from the Rockies and even the Great Lakes and Midwest. You dont want to miss that one! Midwest Round 1 Recap – One Word Summary: Smokin’! 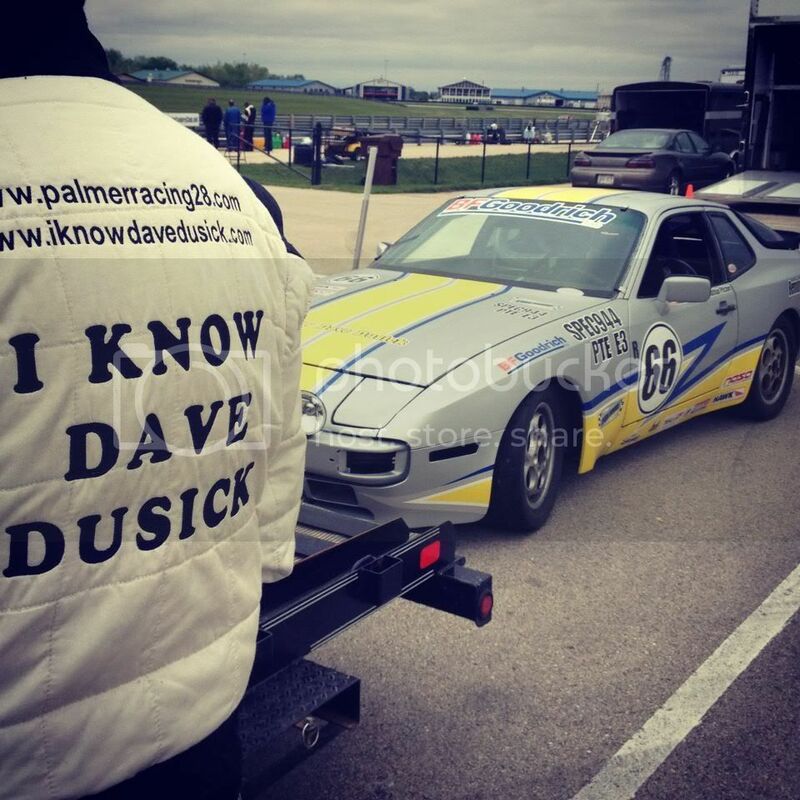 The NASA 944 Spec Midwest season opened April 20-22 with smokin’ lap times, close competition, and clear, cool weather at Autobahn Country Club. The conditions were perfect for great racing: 50 degrees; sunny; and a double digit field of sharply prepared cars at the nation’s premier motorsports country club. Did I mention that the lap times were smokin’ fast? The field jumped into Round 1 qualifying as if the offseason never occurred. Eric Kuhns took the pole under lap record pace, with Neal Agran only a hundredth of a second behind. Dan Pina and Angel Blazquez captured row 2, followed by Ken Frey, Sid Chhikara, Michael Dalton, rookie Kurt Ristow, and Ray Freundt, who started “shotgun” after a malfunctioning transponder left him without a recorded qualifying lap. At the start, Kuhns did a masterful job of moving Agran over to the left, giving Pina an opening to move forward and challenge for 2nd. Agran and Pina ran through Turn 3 mirror-to-mirror, with Pina coming out the victor, Blazquez close behind in 4th, and Kuhns taking advantage of the melee to build a small gap. Agran managed to re-pass Pina under braking for turn 11, by which time Kuhns had built a three second lead. An epic chase followed, as Agran and Kuhns reset the lap record time and again in their identical Pine Tree Motorsports cars. After 35 minutes of lapping at sub-qualifying pace, Agran managed to close only half the gap; Kuhns took the checker with a 2 second lead and scored the new lap record of 1:39.8 to boot. Perfect bifecta! Behind Kuhns and Agran, Pina held third over Blazquez, nicely working traffic to open a gap. Frey, Dalton, and Chhikara engaged dramatically for 5th, swapping the position before Frey regained it for good over Dalton in 6th. Ristow finished in 7th, while Chhikara was forced to the pits with an unfortunate cut tire and Freundt retired with a leaking exhaust. Lap times across the field were… smokin’! Several drivers recorded a personal best and reached their target times for the weekend. Sunday dawned with a clear blue sky, lots of sunshine, and more cool temperatures. With ideal conditions ahead and everyone back in the groove, several drivers took advantage of TraqMate data coaching and a chalk talk by Agran and Freundt on Sunday morning. And the lap times reflected it. Agran took the pole, with Pina on the outside of row 1. Positions three to seven qualified within tenths of each other. Series regular Sam Grant and Frey secured the second row (Kuhns was unable to attend the Sunday race and generously loaned his car to Grant for the day). Blazquez, Dalton, Chhikara, and Ristow filled out rows 3 and 4. When the green flag fell, Agran held off Pina for the lead through the opening turns. Pina was not to be denied, hounding Agran for three laps with a pace below the prior lap record and some cagey feints. Agran was ultimately able to use traffic to stretch out a lead, at which point he went to work trying to regain his lap record and take the overall win from FFR driver Brian Sanders. Sanders and Agran exchanged the lead twice, with Sanders taking the overall win and Agran coming *this close* to getting the lap record back (picture a thumb and forefinger a tenth of a second apart). Pina turned in a flawless drive for 2nd (and 3rd overall). The battle for 3rd and 4th raged throughout the race. Blazquez methodically worked his way past Grant and Frey in the opening laps and then took advantage of the scrapping for 4th to check out in lap 9. Grant and Frey traded 4th multiple times, with Grant pulling it out, followed by Frey and Chhikara at only a 4 second gap. Dalton was able to pass Chhikara for 6th in lap 5 and briefly join the fracas for 4th, but was unable to hold the position and soon found himself facing an onslaught from a charging Ristow. This culminated in the best battle of the race, as Dalton and Ristow spent the final 20 minutes almost nose to tail. Dalton was all smiles after emerging with the position by less than 0.3 seconds at the line. With this race, Kurt Ristow completed his NASA rookie weekend and brought his lap times into very competitive territory. We’re excited to have him as a regular member of the series, but skipped the traditional Gatorade cooler shower due to the weather. Frey and Grant also deserve special mention for hard charging laps in this race. NASA Instructor Frey took advantage of our regional allowance permitting him to use up a set of TOYO R888 tires and came within a couple of tenths of the R888 lap record. Grant took 4th never having seen the wickedly technical Autobahn south track before (or driven Kuhns’ car) and turned amazingly competitive lap times. Absolutely incredible! Several 944 Spec drivers took the green for the opening round of the Midwest Endurance Challenge on the Autobahn full course Friday afternoon. Agran and Kuhns shared Kuhns’ #80 car in the hyper-competitive E3 class, with their sights set on a third series championship. Blazquez used the enduro as a warm up and shake down, running the 90 minute version in E2. Michael Palmer ran the full 3 hours as a test and tune for his new car, which looked sharp and will be a great addition to the series. Blazquez turned in a perfect, consistent 90 minute run with no issues to take 2nd in E2. Warm up and shakedown fully accomplished! Agran and Kuhns also had a spectacular run, with quick pit work by Jim Hartman, Kelby Hartman, and Sid Chhikara bringing them home in 1st – a mere 5 seconds ahead of the 2nd place Miata of the Aaron Kaplan team. This race was a corker, with Agran earning the E3 lap record in the first half and Kuhns screaming out of the pits directly in front of Kaplan to take the class lead after the driver change. Both cars remained within a few seconds of each other, exchanging the lead two more times before Kuhns drew it out to victory. Besides having an outstanding time, Midwest 944 Spec drivers took home over $1500 in TOYO, HAWK, and BFG contingency dollars this weekend. A special thanks is due to Jim and Kelby Hartman, who offered technical support and superb lunchtime grilling to all competitors during the event and put in long hours over the past 2 months on final preparation for half the field – all of which ran trouble free. If you’ve read this far and you’re not racing with us… why not? We’d love to have you out to an event and give you a ride, let you take a test drive, and get you involved. We believe 944 Spec Midwest is the best way to get racing fast and to get faster!